Ah, Saturday. Time to kick off Games on Demand! This is the part of the con that I'm currently responsible for, and where we get together and pitch games, and it's all very ad hoc. First off, one success of this con was sourcing players at Games on Demand who were interested in various scheduled games that were short players. We donated 6 players to 3 different games (from memory: Traveler, Jinkies, and Wild Talents; maybe Demigods?)... I say "donated" but really we just pitched those games along with the rest and players chose them. So: bringing players where they were needed... huzzah! Ancient Technology is dying, and the Liminal along with it. We travel together to The Foundry, the Liminal's homeworld, where Ancient Tech was born. Of course, just like the original Fall of Magic with the "Magus", the Liminal is undefined. My experience with this game has taught me that a middle ground between 'completely undefined' and 'a discussed and agreed upon known entity' is useful, so we're all on roughly the same page starting out, or at least close. We decided to go with my method of "rumors". Each of us talked about one rumor we'd heard about the Liminal. This gives us a starting framework that is still completely loose and open to interpretation and changes. So, the current version of the game comes with an amazing space map that is lovely. I will readily admit that using the map provided, on an iPad or some tablet, zooming into each location, would be very evocative and thematic. That said, I couldn't print it out large enough to be visible (and don't have a reasonable tablet), so instead took it upon myself to print each location on 3x5 index cards that I could easily pack and bring and play with. And they worked exceedingly well. The current version of the Autumn of the Ancients map, as of this writing. Characters included Dwi the Indigene of Libery's Landing (me), Nebo the Specimen of Eco-Station 1, Wolf the Exile of the Capital (Dan), and Alex the Professor of the Aureate Federation (Kevin). I'll say this: If you like what Fall of Magic does, you will not be disappointed here. You can easily get a similar sweeping and emotion-filled narrative. We had great flashback moments of conflict and genocide, silly scenes of wonder and also over-the-top professor diatribes, bitterness-filled meetings with an old assistant whose studies were spurned, and emotional scenes with our lovely uplifted specimen both filled with wonder, and innocence lost. We played a good 3+ hour session, and decided to call it there. I'd happily play this over multiple sessions (and as of this writing I've placed it up on the Gauntlet calendar to run in April). Feedback: I think the game is pretty solid as written. Playing on a map is difficult unless you are well prepared, but on a tablet with zoom-in and out capability would be great and thematic for the space theme. That said, I printed it on index cards and that worked very well; so well and portable I am considering doing this for Fall of Magic itself. One negative criticism was that many of the flavor text / story cues for locations were repetitive with "The hospitality of the ____." Although of course you can interpret "hospitality" to mean many things, positive and negative, I would prefer to see some variety in these. We finished a little early, which allowed me to complete some of my Strategicon math trade game trades, and also quickly check out the dealer room. I'm glad to see that the indie RPG dude is back and selling all sorts of great games, and I even hung around the booth for a few moments talking up some of these to random buyers. Headed to the room with a few friends from below, ate some bring-it-yourself food, and took one of those nice, short social breaks. Most people don’t believe in monsters, but you know the truth. They’re real, and it’s your task to bring them down. This revised edition of Monster of the Week brings that adventure to life. We had a pretty eclectic group of monster hunters, but interestingly enough, all four of us chose strong magic-wielders. The magic-type stat for this game is called Weird, and all of us had a +2 or +3 in that stat. This definitely flavored the session strongly, and in a way that I think we all enjoyed. I created Aboud, a half-Ethiopian half-Spanish Jew, but from a strange orthodox sect called Solomon's Key that follows the "real" form of the Kabbalah and wields magic. The sect is strict in laws, and is weary against outsiders and especially "abominations", such as Unique's character, a Succubus. This invited some good tension, and some interesting ways in which the story played out. The overall adventure was one in the Pacific Northwest (thanks Unique! ), and so we ended up with some first nations skinchanger type creature, someone filled with hate so deep that harm to many innocent bystanders was just par for the course. There was a lot of us going in all sorts of different tangents and directions at the start, not waiting for one another and diving into different hijinx, but as the story went on we started to pull together and some good inter-character drama unfolded, and bonds seemed to tighten. Would've been fun to see where this team would've gone as a campaign. Super-props to Even who ran character Jae-Chill, a youtube streamer and social media nut with a large following (many of which are part of an arcane user streaming network). He evoked this character sooo well, it was extremely entertaining. Best part of the scenario was that we all worked really well together, and it felt like a good synergy and combination of drama and heroics. After the game there were some others who were diving into yet another ad hoc game, but I knew I was hitting some energy limits. I am proud that I was able to pull myself away, go up to the room and nap, and then eat some grub before coming back down to find them ending their session. From there, I went to check out the live recording of the Happy Jacks RPG Podcast. They do this almost every Strategicon (sometimes missing Gamex due to the Renaissance Faire, although sometimes making that date as well). The next 2 hours included the usual chit-chatting about games, including up on the mic. 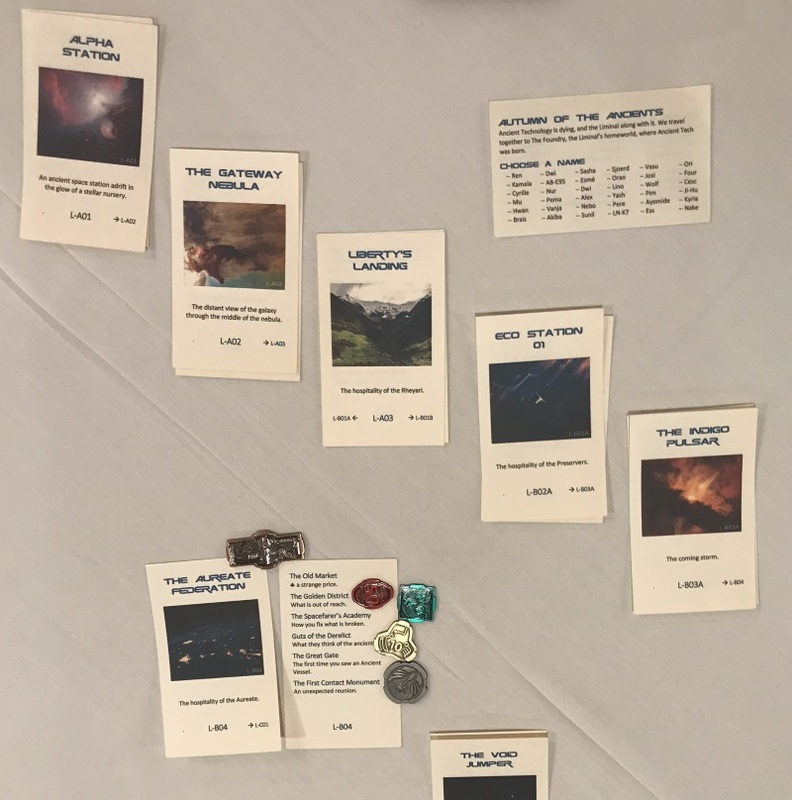 I got some props for Ten Candles, and gave some props to games such as Bedlam Hall and A Game of Throne Acquisition. The event gets blurry a bit later on due to alcohol imbibing habits. And then around 10pm, it was time to head down to the last event of the eve. Want to suffer through the chaos? Here you go! Post-podcast it's time for our late night jam. In the past I've run Dread, and Bob's run Monster of the Week, and lean towards other good creepy stuff. In this meetup my friend Sasha from the Story Games Glendale meetup showed up with their own game-in-testing! They ran a table of three, including friend Chris Shorb; can't wait to try it. My friend Howie showed up after over a year of missing the con (dang children! ), and because the rest of the audience didn't volunteer to run something, and because getting a closed room for another run of Ten Candles was an impossibility on a Saturday night, I went with a good standby for a large group of 7 players: The Final Girl. The Final Girl emulates a slasher flick, and we did some random card draws to see what the fates would try to suggest as a scenario, but they were all weak-sauce. So instead I pitched a scenario which combines two pre-canned ones from the game: "It is opening night of a romance movie about vampires. The characters are all vampires coming to see the premiere, but who are being hunted by a human vampire hunter!" We made a bunch of characters, and did a few intro scenes. As always one thing I love about the game is having different players play the same characters over different scenes, and seeing how disparate the characterizations are. I was the culprit of one of these, running one of the ancient vampires in a weird slapstick way. Everyone later called that character the Mr. Bean of vampires, which was kind of hilarious, especially as I was just being silly because I didn't know what else to do in that scene. Oddly enough, our Final Girl was not a vampire, but in fact our human universal blood donor (who gets bitten just before the end, with sunlight streaming into the theater and killing off some of our final characters). He wakes up a few days later, and the story continues. Off to some late-night sleep, in preparation for getting the daughter the next day (and some early morning GoD loving I didn't expect).